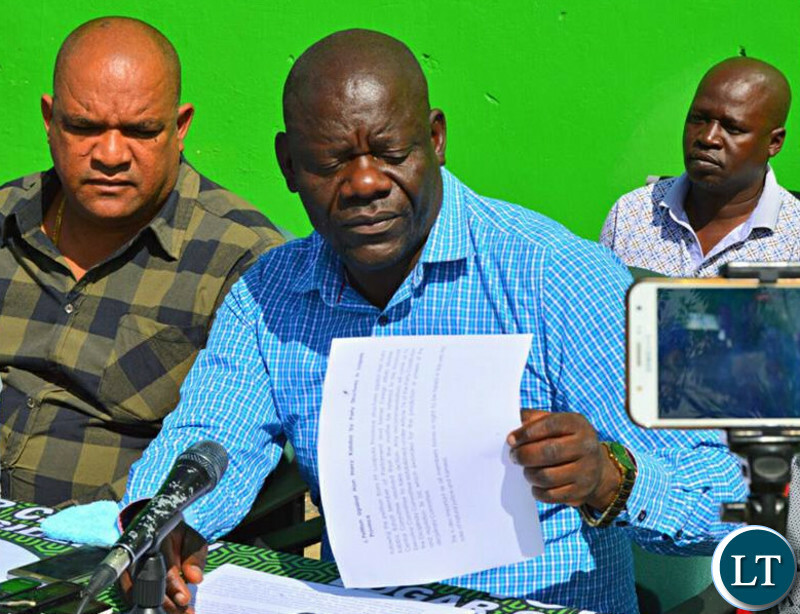 PF Secretary General Davies Mwila has asked the Lusaka High Court to direct the Speaker of the National Assembly Patrick Matibini to declare the Roan Parliamentary seat vacant. Mr. Mwila says the decision by Dr. Matibini to refuse to declare the seat vacant is illegal and against Article 72 of the Constitution of Zambia. He has argued that the decision by the Speaker to give latitude to the court to conclusively deal with the matter is also unlawful because he does not possess such power. Mr. Mwila says the dismissal of Mr. Kambwili’s case by the Court entails that there is no challenge currently pending before the courts of law. He says there is no suit pending before the High Court to challenge Mr. Kambwili’s expulsion. This is according to a statement of fact and grounds upon which the relief is sought. In this Matter, Mr. Mwila has sued the Attorney General as the first respondent. Does the Speaker have power to declare a seat vacant? These High Courts are being ordered everyday by PF. Maybe they have to wait for a bell from PF Secretariat for them to take tea-break. I HAVEN’T HEAD OF THAT. So should it take the courts to declare that seat vacant? I thought CK’s contention of his expulsion was thrown outa court. Is Dr Matibini safe in 2021. PF that nominated Matibini for position of Speaker in 2016. Now, PF has declared his decisions illegal. In my view, the action by PF to drag Dr. Matibini to court is loss of confidence in him. The court action is clearly a writing on the wall that should PF win elections in 2021, Dr. Matibini will not be Speaker. So Dr. Matibini should pray hard that PF loses the 2021 elections, otherwise should circulate his CV elsewhere. @1.2 Maybe Kambwili has some dirt on the speaker. …just thinking. Butter on a hot knife, he should also sue for being denied access to his constituency. Advice to PF take the case to ConCourt. They’ll expel Kambwili without even thinking. High Court still follows the Law. Even if the high court refuses to declare the seat vacant then PF will just take it to the concourt where obviously they will find a positive outcome. Either which way there is going to be a by election in Luanshya. PF, the challenge I have with you is that you are looking for a challenge free democracy! You are intimidated by useless issues and this have no time to focus on delivering your campaign promises. Can you concentrate on hunger, disease and illiteracy eradication, focus there!!! How does the whole PF fight a mere man..please otherwise 2021 we will not spare you! Don’t Zambians are fools and blind! He’s within his rights. Please don’t take things out of context. Each time HH wants the court to do something he uses the same language. In addition Mwila on behalf of the PF has sued the Attorney General which is also within his rights. Maybe find a lawyer who will explain this in simple language. High court will always decline to expel CK for obvious reasons. Kambwili has mentioned over and over that he is not interested in being a member of PF , however, under the new constitution and because he feels he was unjustly expelled , he would like to retain his seat as an independent . Its only fair that he be allowed to be heard irrespective of the time ( Even Pres Lungu’s impeachment motion has been halted due to court issues , meanwhile time is running out). I also think the PF should be more thankful to Kambwili for helping ECL win 2016 elections , the Man campaigned relentlessly , and mind you , he has a voice that pulls people to his rallies. ECL is not a charismatic speaker , and non of his current Ministers can match CK , therefore 2021 will be tough going by the way things are moving.